"Raksha Mancham’s project 1.200.000 Dead Tibetans combines industrial, noise, harsh electronics sounds with true stories about the victims of the Chinese occupation and genocide on the Tibetan Nation that takes place till this day. Mostly a spoken word album about torture methods used by Chinese on Tibetans using the genitalia. Well, it's not so sick as thought after reading this description, but it's quite impressive work anyway. Much better than I expected. According to the reviews, it differs from other Raksha Mancham's works in terms of sound... but I haven't heard his other albums yet, so I have nothing to compare it with. 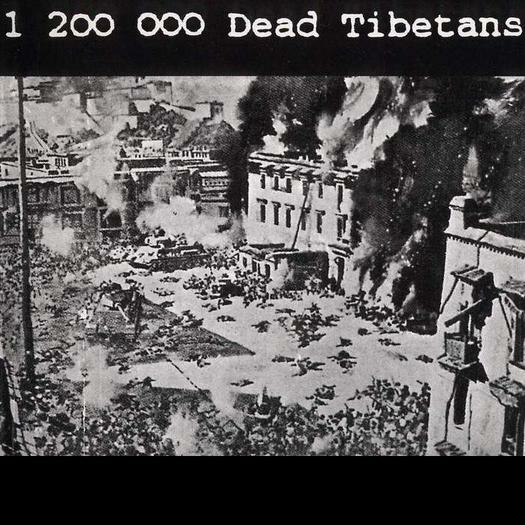 As for the lyrical content (which is all in English) - I take the neutral position in Chinese-Tibetan conflict, but the whole conception of "1.200.000 Dead Tibetans" is very interesting anyway.